Renter Wishes: What are Tenants Looking For? Understanding what tenants look for in potential rental properties — and implementing those changes in your property — can make a huge difference in your bottom line. Property managers and landlords who know what tenants want profit by increased rents and decreased downtime with properties that are easier to match with renters. Here’s a look at some common renter wishes…. Apple, Google & the Future of the Smart Home | How Will this Impact Your [Smart] Business? Smart Control Technology & Louis C.K. © 2019 PointCentral. All Rights Reserved. Here are the answers to your most common questions! Why install PointCentral Smart Control? Please visit our solutions page to understand what we can do for the types of residential properties that you manage. Do I need a router to use PointCentral? PointCentral uses cellular communication and does not require an internet router for any device, except for video cameras (these devices need the higher bandwidth of WiFi, but our video cameras use VPN software to make up for WiFi’s lower security than cellular). Does PointCentral offer security cameras? 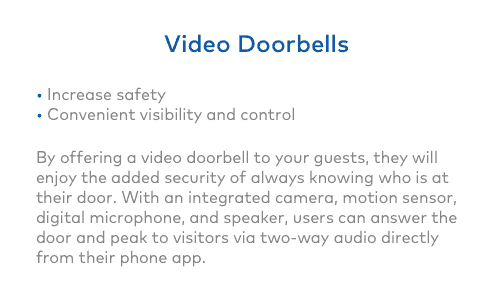 PointCentral offers a variety of cameras for us by property managers and residents, including still shot cameras, video doorbell cameras, exterior video cameras and interior video cameras. How do I find what keyless entry devices I can buy for your service? My property manager is shifting over to PointCentral. Please contact your property manager to understand what lock options are available. Is it possible to have multiple locks that are synchronized with the same entry codes? 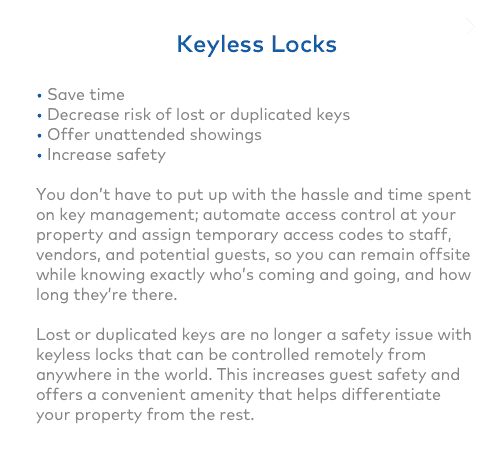 Yes, multiple properties and be synchronized with the same entry codes, and multiple locks at the same property can be synchronized with the same codes. Do you have interconnected locks/mortise locks / three-point locks? We have various styles of locks available. Please work with your PointCentral contact to understand what options fit your needs. Does PointCentral have any solutions for parking lot access or gate access or is it strictly doors? Strictly residence and common area doors at this point, though we are working on greater access control solutions and expect to announce these new services soon. I am trying to access a property via PointCentral. Where can I register? Please call us at 888-532-3032 and select Support or contact your Property Manager. 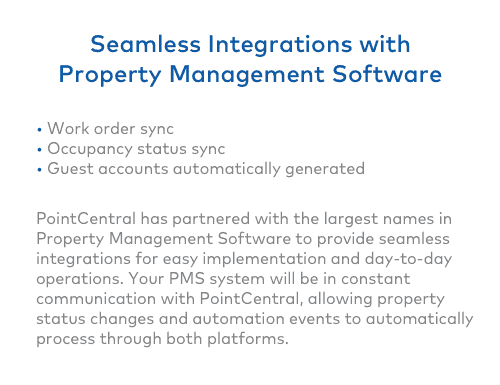 How do we enable one of your Property Management Software integrations? Our extensive list of partners is listed on our About Us page. Integrations are included as part of our standard software package, so please contact your Account Manager to enable these integrations. Can I create codes that only last for a couple hours or a day? Yes. When you create a code, you can select a time frame for the code to work. Does PointCentral interface with smart locks other than Yale? We’ve chosen to work with Yale based upon their rich history of providing a robust and environmentally sturdy lock. Can you do humidity monitoring in my properties? Yes, the PointCentral Smart Thermostat can monitor, report on and automatically adjust the humidity level in your properties. Is support available for property management staff and residents? Who does the team call if we are having issues with a self installation? Property management staff that elect to self-install get access to our MobileTech app that helps walk them through installation and setup steps. If you run into questions, simply call us at 888-532-3032 and select support. I have 2 thermostats in my home (upstairs and downstairs). Can they both be set up to work with this? Yes – the PointHub our hub supports multiple devices, including multi-thermostat and multi-lock homes. Can the locks withstand harsh weather conditions, including a coastal climate? Yale has been innovating in the lock industry since 1840. Yale fully stands behind the locks, including coastal climates all around the world, with a 3 year warranty. How does Energy Management work? 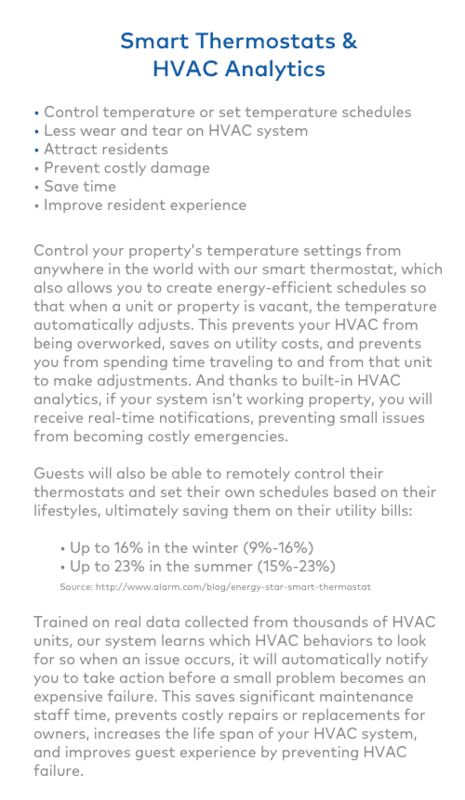 Our thermostat works with optional sensors and property status to coordinate temperature control with resident demands in an energy efficient manner, saving 10% to 15% off monthly bills on average. Our system also provides the property manager with data when an HVAC unit is not performing properly, and also allows the property manager to set temperature ranges to prevent system damage. How does the keyless lock work? Here is a video explanation of how the Yale keyless lock operates. How does the system function if cellular service goes out? Cellular service has close to 99.9% reliability, while Cisco reports that 43% of broadband/WiFi customers experience an outage at least once a month. 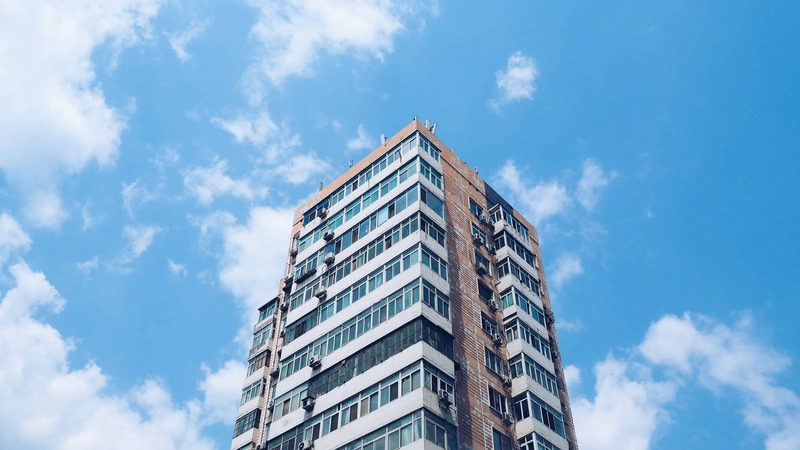 In the extremely rare case that the cellular network goes down, existing codes are maintained in the lock and there is a hidden ‘backup code’ that would allow property managers to grant access in the event of an emergency. How is the PointCentral system installed? 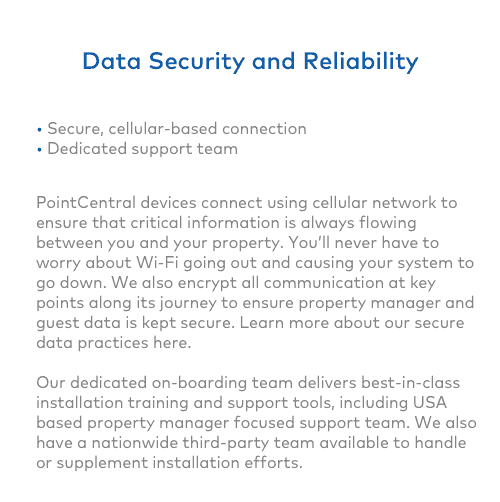 A standard PointCentral system includes our cellular hub, a door lock and a thermostat. On average, it takes a maintenance technician 20 to 25 minutes to install and setup this hardware.Here is a link to an installation overview video. We also have certified 3rd party installation partners nationwide that can also do installations for a small charge. How many different codes can be assigned to the system? The locks can store 240 unique PIN codes.Expiring codes are deleted as they expire, freeing up space for new codes. What if a lock is left unlocked? The locks can be set to auto-lock, so unlocked doors are not a security risk. However, if the locks are set to manual lock, they are locked by simply touching the keypad. If the lock is left open, you can remotely lock the lock from any web-enabled device. What if an Authorized User loses their access PIN? Many devices are battery powered, and many of the main-electrical powered products, such as the thermostat and hub, also include a backup battery, to maintain function during the occasional power loss. What is difference between Oracode Live and PointCentral? I'm looking at company X and PointCentral - why are you better? How do I become a Point Central Dealer? Please contact us if you are interested in being a partner. If we want to switch from a competitor, what does it take to transfer the hardware over to your system? Please take 2 minutes to schedule a demo with us. What is the name of the PointCentral App that residents can access? Can I lock and unlock my front door from my phone? Yes. With the push of a button, you can lock and unlock your door. You can also use a code at the lock, manually lock the door from the inside, or use Google Home or Amazon Alexa to lock doors from within the home. Can I change the temperature of my house from my phone? Yes. You can customize settings for your heating and air conditioning and make changes at anytime via your smartphone. You can also change the temperature on the thermostat by directly interacting with it, enabling scenes or geo-fences, or using your voice with Amazon Alexa or Google Home. Can I eventually control my lights, garage door and other appliances? Yes. Please talk to your property manager about available accessories. Can I control my PointCentral system with my voice? PointCentral works with both Google Home and Amazon Alexa. We also have apps for iOS and Google Play devices, an app for the apple watch and apps for the Apple TV and FireTV. Can I set temperature schedules so when I leave for work, the temperature will automatically change? Yes. Temperature schedules can be set and changed via your smartphone, tablet or desktop computer. Can I pair any Z-Wave device with the PointCentral hub? 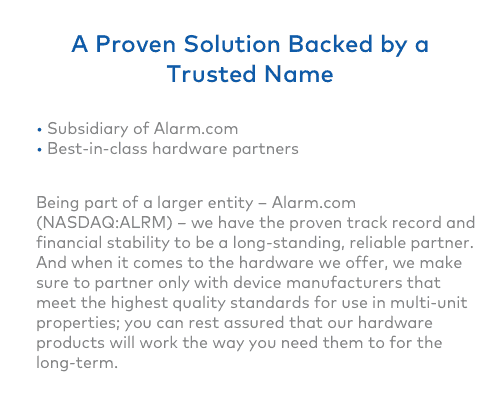 We have taken care to select partners who manufacture devices that we know will hold up in rental environments, and we only work with those devices. We are confident that you will find a device for every need, and we are committed to making sure these devices are competitively priced. If you are a resident, please contact your property manager. If you are a property manager, please call us at 888-532-3032 and select support. What are your tech support hours of operation if I have problems with the system? I cannot remember my password. How do I reset my password? Where do I find list of closing codes? Here are the closing codes. Please reference lock support documentation on our partner website. I am trying to change the temperature in my rental unit, but cannot. The temperature may be automatically set based on the house status. Please call us at 888-532-3032 and select Support. I am a new resident as of yesterday. I was given a temporary password but nothing for a username. Your username is the email you were registered with. If you are a resident, this is the email address that you gave your property manager. If you are a property manager, this would be the email address you gave us during onboarding. Please visit our customer login site to login with this username and the temporary password you received. How can I recover my temporary password? Please visit our customer login site and select login help if you need to reset your password. If you are a resident in a PointCentral enabled home, please contact your property manager to register your Account. 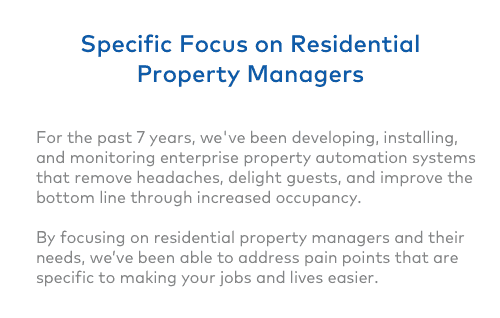 If you are a property manager who is interested in learning more about us, please take 2 minutes to schedule a demo with us. Can I create a personalized code, such as my birthday? No, due to security reasons, the system generates random codes for users. Can I create a user code from my phone? Yes. You can create a user code at any time from your phone. Please login to our customer site and create a new user. If you are a guest or tenant in a property, please contact your property manager or call the number and select Option 3. If you are a property manager please email us at [email protected] or call the number below and select Option 2.